Autumn is a prime season for migration. It is almost impossible to ignore the sounds of the Canada Geese as they pass overhead and thousands of other birds pass by unheard, heading south to warmer locations. Some dragonflies migrate too and at this time of the year it is not unusual to see some of them patrolling high in the air. A good number of dragonflies spend a lot of time perching, and they tend to be easiest to photograph. 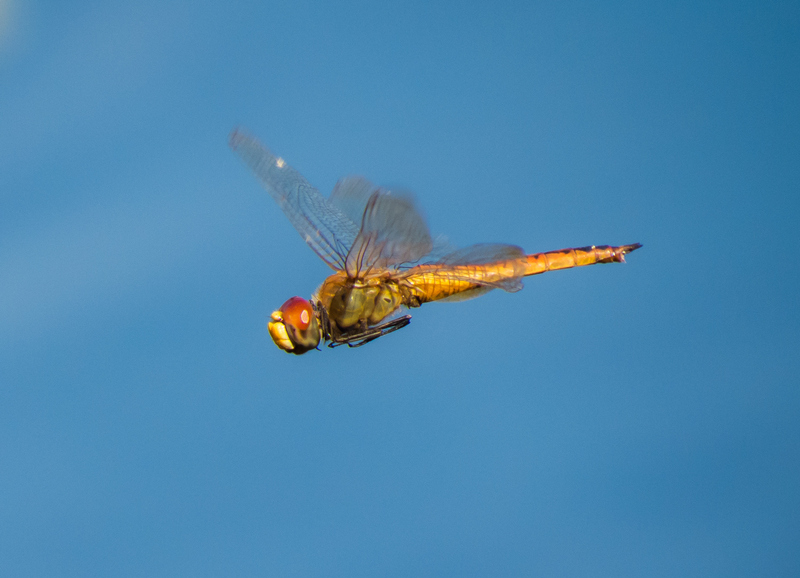 Other dragonflies, like the species that migrate, spend most of their time in flight. Their stamina is amazing and your patience has to be equally amazing if you try to wait for them to land to photograph them. The alternative is to try to photograph them in flight. Yesterday I spotted a couple of Wandering Gliders (Pantala flavescens) flying patrols over a small pond at Occoquan Bay National Wildlife Refuge. Wandering Gliders are the most widespread dragonflies on the planet and have an almost worldwide distribution. I watched the Wandering Gliders for a while to see if I could figure out the patterns that they were flying. Gradually I realized that they often would pass by a certain part of the shore and hover a little and that became my target zone. With my Canon SX50 superzoom camera in hand, I visually tracked the dragonflies in the air and attempted to photograph them. Mostly I was unsuccessful, but I did get a few decent shots. In the first shot below, the sharpest that I was able to manage, the Wandering Glider was flying above eye level, so the beautiful blue sky served as a backdrop. In the second image, the dragonfly was flying below eye level and the ripples in the water create a beautiful pattern in the background. When I consider the two images, I am torn between two competing impulses—technically the first shot is superior, but artistically the second shot appeals to me more. Fortunately, I don’t have to choose one over the other and can post both of them. Looks like it’s coming in for a landing. on October 7, 2018 at 6:48 pm | Reply Molly D.
Amazing that you could capture that midair wonder on film! 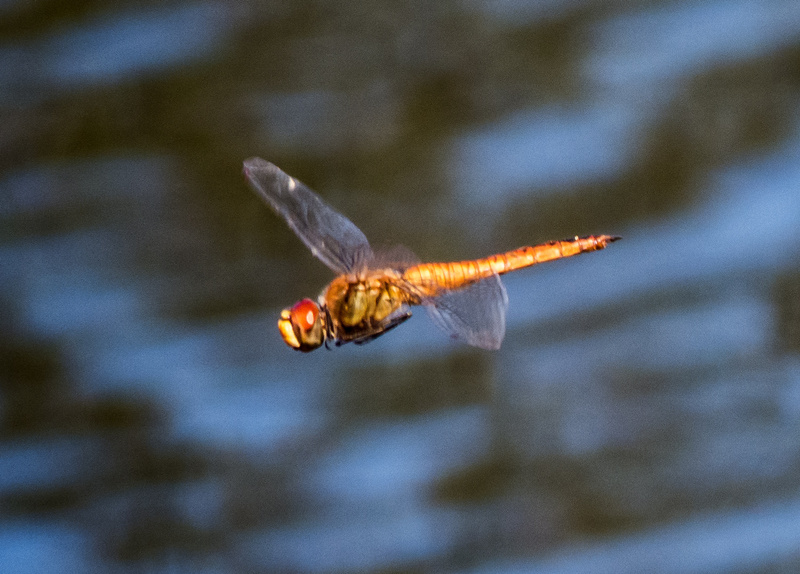 I am pretty persistent and was fortunate that the dragonfly hovered briefly and that’s how I was able to capture the image. I am glad, though, that I was shooting digitally and not with actual old-style film, because I took a lot of shots to get a few decent ones.